Scheduled games may be changed and played on any day and/or time with consent of both coaches. Region would supersede conference games. An officials’ coordinator is employed by the conference-Danny Harris is the officials’ coordinator-both regional and conference games. It is the coordinators responsibility to supply high qualified referees for every conference games. A fee structure for a three person crew will be negotiated and determined. Division I teams will play each other twice (home/away) and the Division II teams once on a rotating basis (home one year-away the other year). Division II teams will play each other twice (home/away) and the Division I teams once on a rotation basis (home one year and away the other). The championship will be decided by the best winning percentage. If a tie would occur, then co-championship will be awarded. All-Conference will be done in the following manner; a) Coaches may nominate as many players as they wish, b) Coaches vote for ten players in no specific order, but may vote for their own, the top ten vote getters are all conference. (If a tie occurs all student-athletes involved in the tie will be all-conference). d) Players receiving a vote is named to second team. E) Those who were nominated and didn’t receive a vote will receive honorable mention. With majority approval of the coaches present, a coach may request a student-athlete to be added to the honorable mention list (one per institution). Coach of the Year-each coach may place a vote for coach of the year. Coach can’t vote for themselves. Coach receiving the most votes is the coach of the year. Nominees may be sent with a representative or via e-mail if a coach is unable to attend the meeting, by 3rd Wednesday of February. Coaches will vote for a team that demonstrated the best sportsmanship throughout the season. The team with most votes will be awarded. If a tie does occur, then co-sportsmanship awards will be given. Filming of opponent games. Colleges may video only those games in which their college participates. 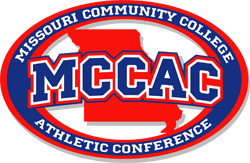 College should not exchange game film outside of the MCCA Conference.